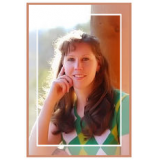 April W Gardner writes adult and middle grade historical fiction. As a proud military spouse, she has performed the art of homemaking all over the world. Currently, she makes her home in Georgia, the heart of ancient Creek Country. On the frontier, Adela McGirth’s life is simple, rugged, and exactly to her liking. Her greatest concern is whether to marry the settlement’s most eligible young officer. When a distant war among the Natives spills over into a nearby skirmish, life takes a perilous turn. Deep in enemy territory Adela must choose between the man she loves and a baby that has yet to be born; will she be strong enough to wait on God's provision? A peace-loving yet loyal Creek warrior, Totka is forced to align with the extremist Red Stick faction whose purpose is to eradicate the Whites from Creek soil. In the midst of battle, Totka is assigned to protect those he is expected to hate--and kill. Life was simpler before his enemy became a beautiful face with a quiet strength and dignity he cannot resist. Having lived a life plagued with death and loss, Zachariah McGirth is a man on a mission - he'll have his revenge or die trying. Blinded by grief, he can't see his way clear of yet another tragedy. Why has God taken everything from him...or has He? Their lives molded by the course of history, can these Wounded Spirits learn to rely on God's grace during one of the bloodiest conflicts in the South? April grew up hearing that her many times great-grandfather was Chief Red Eagle/William Weatherford. Turns out, he’s probably not, but she still cherishes the stories of his bravery in the face of Jackson’s overpowering army. It was the story of his extraordinary leap from the bluff that made her wish to read the account in novel-form. She’d never written more than a high school paper, but she figured that if this particular story was ever going to be written, why not do it herself? Eight years later, she held the book in her hands. This is a solid debut from Ms. Gardner, one that demonstrates not only her skill with words, but her insight into the human condition. The characters will grip your heart, the story will seize your mind, and the hope at the end will leave you with the surety that your God is bigger than any human troubles. "Wounded Spirits is an epic historical novel about a less explored time and place in American southern history. Author April W. Gardner tells the story from all sides caught up in the Indian wars of 1813 with sympathy and honesty. Her resourceful heroine, Adela, holds the family together in times of love, loss, and forgiveness. I look forward to the continuation of the story in future novels."